If I'm lucky, it might even be healthy. It doesn't always work out that way though. They aren't sweet, but I can down a bag of plain Lays potato chips in 5 seconds flat! However, this past weekend, I kept it healthy. Granola came to mind as it is healthy and meets all of the requirements of my taste buds when I'm stressed. But this time I decided to make it myself. I put a little twist of my own on a few recipes I found and it turned out absolutely divine!! See the recipe and more pics after the jump! This granola is exactly what I needed in my life. It's crunchy and naturally sweet with a very small hint of saltiness. It's also versatile. 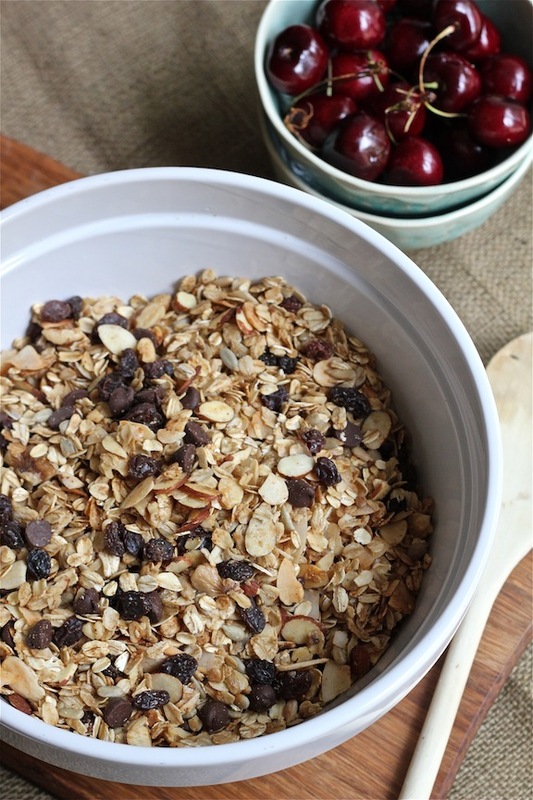 I basically thought of my favorite granola ingredients and added them to the bowl. You can add whatever makes you happy and it just works. Preheat the oven to 325 degrees. Line a large baking sheet with parchment paper and set aside. In a large bowl, combine the oats, walnuts, almonds, sunflowers and coconut flakes. In small bowl, thoroughly whisk the oil, honey, cinnamon and salt together. Add it to the oat mixture. Use your hands to toss everything together. Make sure all of the oats are coated with the oil and honey mixture. Pour the mixture on the baking sheet and evenly spread it around. Bake it for 15 minutes or until everything has browned. Toss it with a spoon about halfway through to make sure it bakes evenly. Once it is done, immediately pour the mixture into a bowl or on another baking sheet to cool. When it has completely cooled, add the raisins and chocolate chips and stir. I might have eaten a few or perhaps several handfuls of it with a few fresh cherries. I packed the rest in mason jars and gave them to friends. It was the perfect little gift and would be good as cereal, on yogurt or in the kiddos lunch boxes! I'm a granola junkie like you have no idea! This looks amazing Tiffany, I must try it! Looks and sounds good AND its healthy! Perfect...finally a recipe I can copy and not feel guilty over...haha! I love granola. Its the perfect snack and I keep it everywhere! I really, really need to make my own granola! This looks wonderful, I love cherries. OYES! I'm the same way...a little crunchy, savory + salty and I'm putty in your hands! This is the perfect solution and healthy to boot! Who wouldn't want to be gifted with that jar of love?? Perfect hostess gift too, you're chock full of awesome ideas! After I have granola, I always feel proud to have eaten a healthy breakfast. I love the mason jars too, nice touch. Granola is my favorite breakfast! Yum, I need to switch my breakfast routine to something like this. Easy and appetizing!